For the longest time, no one hated the concept of reading novels on an electronic reader more than I did. I'm what you'd probably call a classic reader: I need the feel of pages between my fingers, the smell of a freshly printed book. I balked at the idea of doing away with such an integral part of my reading experience. Then sites such as Netgalley and Edelweiss came along. These websites allow reviewers to apply for review copies electronically. Of course I wanted to hop on board immediately. My hands were itching to obtain so many available ARCs. More and more authors have begun to reach out to bloggers via electronic sources. In fact, some books are not even being printed as hard copies. By not giving into the electronic wave of reading, I was missing out on potential favorites and best-sellers. As a reviewer and a self-proclaimed bibliophile, I pride myself on being able to keep up with the newest and hottest releases in young adult literature. However, as electronic readers have grown in popularity, I have found myself on the outside. I began to feel disconnected, and I wondered what I was missing out on. I received my first Kindle as a Christmas gift this past year. And now I'm in love. I know, I know, I never thought I'd say this either, but my Kindle has opened so many new doors for me as a reader and a reviewer. Authors can now send me review copies of their novels in a cost-effective and timely manner. I can purchase electronic books on Amazon and receive them within a matter of seconds, often at a lower cost. Don't get me wrong: I will always adore hard copies. I will continue to add to my physical bookshelves, and I will purchase all of my favorites in paperback or hardcover form. However, I am no longer against the world of electronic novels. If anything, I have begun to embrace the advancement. I now appreciate the ease and efficiency of the process, and I believe it has helped me to become a more avid and dedicated reader/reviewer. 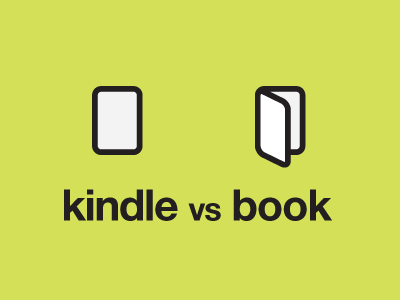 I'd highly recommend any of Amazon's electronic readers, from the Kindle Fire to the older versions. It will revolutionize your reading experience.